In this article, we will look into an example of RxJava map operator. We have seen in our last article the relation between an Observable and Observer, and how an Observable starts emitting items to an Observer as soon as it subscribes to the Observable. If want the Observer to receive a different flavour of the item by applying a function to each emitted item then we need to build a new Observable using the map operator and the function that transforms the item. In the below marble diagram, we show the emitted item being transformed by the mapper function. On the other side of the mapper function, there is the Observer that receives the transformed item. In the below example, we have a list of subjects. Each subject has a list of topics. We use the map operator to convert the Observable emitting subjects to an Observable that emits the topics covered related to the subject. 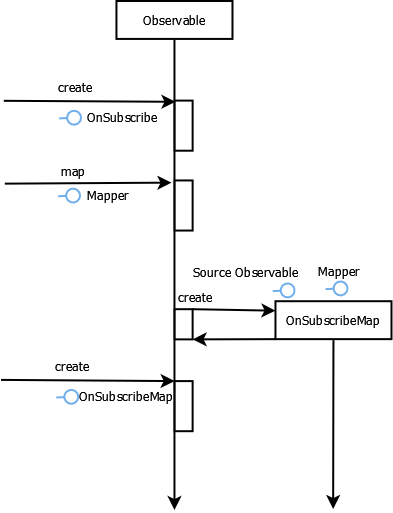 Once map() is applied, a new Observable is created that depends on a new OnSubscribe function that knows the source Observable and the mapper function. In the subscriber’s onNext() callback, we simply add up all the topics. In the mapper function, we build new data which tracks the number of topics that each subject deals with. 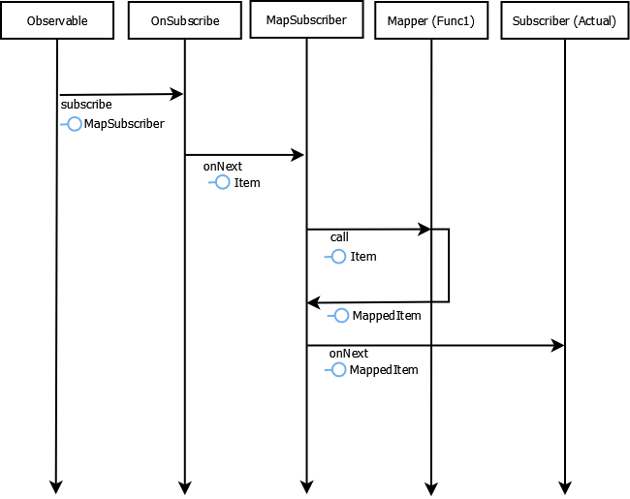 In the below sequence diagram, we show how map() operator results in a new Observable that now depends on a new OnSubscriber called OnSubscriberMap that knows the source Observable, actual subscriber and the mapper function. In the below diagram, we show the sequence flow that follows when an Observer subscribes to the mapped Observable. As you can see the emitted item is first transformed by the mapper function before delegating to the actual subscriber. This was an example about RxJava Map.